A man wanted in connection with the killing of his girlfriend was captured Thursday in Minneapolis, Minn., authorities said. Isaac Campbell, 32, of San Gabriel, was caught following a short foot pursuit, Sheriffs homicide Lt. Gil Carrillo said. Detectives had been pursuing Campbell for nearly two weeks after discovering the body of his girlfriend Liya Lu, 31, in a trash can that had been dumped in an Arcadia backyard. Im glad they caught him, said Lus friend William Moo, of Rosemead. I want to see justice done Thats all I can really process right now. One day the PD promises more cooperation with our reporters on crime stories, the next day they are surly and uncooperative. What gives? Very little information has been released in Tuesday’s shooting that left a man dead on Belmont Avenue. Today a reporter called about an event he witnessed and got a bunch of attitude and no information. Thanks guys. We’re all set to report an unusual rash of flag burnings in a Whittier neighborhood. The burnings, which have targeted the red, white and blue as well as garden flags, have been taking place since August, officials said. There are a lot of crime stories moving forward today. Man-ling Williams pleaded not guilty in West Covina to charges of killing her husband and two children. In today’s paper we had some of the first published comments from Neal Williams’ mother Jan of Whittier. Sheriff’s Detectives helped the rest of the local media catch up with us in the pursuit of Isaac Campbell. He’s wanted in connection with the killing of his girlfriend Liya “Jessie” Lu. Campbell, a former nursing student at PCC, and apparently a part-time instructor there is alleged to have killed Lu and stuffed her body in a trash can. He covered the body with kitty litter, according to sheriff’s Lt. Gil Carrillo. Man-Ling (or manling if you prefer) Williams will appear is court Wednesday a.m. for a third shot at arraignment on three charges of murder. Williams is accused of killing her husband and two small children inside their Rowland Heights apartment in early August. Sadly enough for family members the araignment comes one day before what would have been Ian Williams’ fourth birthday. The picture above is of Ian and his dad Neal. We’re getting two different stories from South Pasadena police about a series of burglaries taking place there over the past several weeks. SOUTH PASADENA – Two thefts of valuables at city residences reported over the weekend are part of what police are describing as a “rash of burglaries” over the last few weeks. Cash and jewelery and other small valuables have been the only objects taken in any of the eight recent burglaries reported in the city, according to Corporal Craig Cooper of the South Pasadena Police Department. “They are going for cash and carry items and ignoring larger items like laptops and cell phones,” said Cooper. He said that in all the cases the burglar entered through an unlocked door in the house. The two weekend burglaries, which took place on Saturday, were reported on Milan Street and Marengo Street, according to Cooper. Investigators suspect that the same person or people have been responsible for all the burglaries, said Cooper. The District Attorney has filed charges against Issac Campbell of San Gabriel in the Liya Lu murder case. One commenter at LA Noir wants to know why there is no coverage of the case. After some thought I think its becase TV is too busy following OJ, Spector and Brittany. And the TImes? well they are apparently doing something other than covering stories n their own backyard — perhaps scratching their heads over circulation drops. Maybe yesterday’s letter writer had a point. 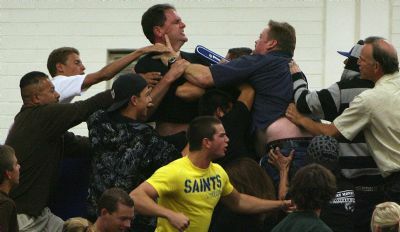 There was a knockdown dragout at San Dimas High last night over (of all things) a girls vollyball game. I don’t know who won the match. Not sure I care. Parents are up in arms over at Fred Robledo’s blog, because he posted the photos. Some are saying its irresponsible to even talk about what happened. Really? I’d say it’s irresponsible to take a match sooo seriously that it leads to a fight. Check out the guy in the yellow San Dimas shirt, seems like he’s ready to go eh? Prep Sports editor Fred Robledo gets some interesting mail He passed this along to me, thinking the writer might be more suited for true crime than prep sports.